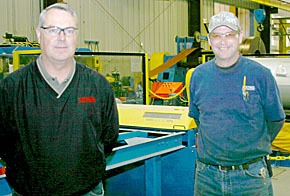 After a recent plant expansion, Sentinel Building Systems of Albion is adding two new production lines to its steel building manufacturing process. Last summer, the company completed a 50 x 75-foot addition on the plant’s southwest corner. This additional area is used mostly for storage of steel rolls and a load-out area, but it made room for a new roll forming machine and a new trim machine that allow the company to produce more of its own building components. “The new lines allow us to be more flexible and more competitive,” said Pat Cleveland, plant manager. The company had previously purchased the sheeting and trim for its buildings from other suppliers. Details in the Nov. 9 Albion News and Petersburg Press Print & Electronic Editions.